Alas, the season of Fall is upon us and many, including myself, may be having a hard time accepting that summer is over. Even here at deVine Wines and Sprits, our lowly beer fridge observes as red wines and spirits fly off the shelves. But, my fellow beer enthusiasts, there is a light at the end of the tunnel. A reason to celebrate. Oktoberfest. Back in 1810 an awesome guy by the name of Prince Ludwig I (soon to be King Ludwig I) and his classy lass, Princess Therese of Saxe-Hildburghausen, were set to wed. Rather than keep the party to themselves, the King decided to hold a large celebration in the fields in front the of the city gates. Horse races were held for the entire public to view and signified the conclusion of the royal event. Fast-forward a couple hundred years and what was once a couple beer stands to quench the thirst of the festivals patrons, had become giant tents filled with people celebrating all things beer. Now, nearly 180 years later, Oktoberfest is the largest festival in the world, grossing approximately 6.4 million people and 710,000 liters of beer every year. Beer featured at the festival must abide by the Reubgeutsgebit aka the “German Beer Purity Law”. According to this law, all the beer must be brewed within city limits and may only contain water, barley, hops, yeast and cane sugar. There are only a handful of breweries that are given this designation, making it extremely difficult to access their beer outside of Europe. This year Oktoberfest begins on September 21 and finishes October 6. Oktoberfest is not only for the Germans, people worldwide travel to Munich to celebrate, and even here in North America mini Oktoberfest’s are held in commemoration. The Kitchen-Waterloo Oktoberfest hosts up to 1,000,000 patrons a year, making it the second largest festival in the world. So, what does this mean for you as an Edmontonian mourning the loss of your summer and dreading the frosty months ahead? Well fellow beer drinkers, Oktoberfest is an ideal if not perfect way to celebrate the abundance of beer that has come into the market as a result of the fall harvest. Not only does autumn imply the return of the usual’s: porters, stouts, red ales. Fall reinstalls the reign of the famous pumpkin beer. Sweet nutty notes with brilliant spice and heart warming pumpkin, A seasonal best seller. September in the USA and Canada also means fresh hopped beers. N. American hop varietals like cascade, simcoe and citra are used fresh to create “wet hopped” IPA’s. This essentially means that only the fresh, not dried, hops are used to make beer. And here is some even better news – deVine Wines and Spirits has made it extremely easy for you to get your hands on these unique and seasonal brews. Starting this week, we will have an entire display devoted to harvest beer. Porters, stouts, American IPA’s, Weissbiere and Pumpkin ale so come in and grab a few to try or host your own party. Need a traditional snack to go along with your beer? 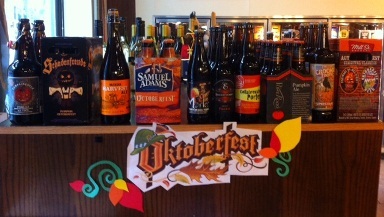 Well our display has a couple Oktoberfest recipes to entice all your friends. It’s our little way of saying “Happy Oktoberfest”. Ein Proust! Here are a few current favourites..